Submitted by mahoney on Fri, 03/21/2008 - 11:07am. TOYS "R" US across the USA including Alaska and Hawaii...Toys "R" Us is a toy store chain based in the United States, Canada, Australia, the Netherlands, South Africa, Hong Kong, India and the United Kingdom. The file also has Babies "R" Us and the combination of Toys "R" Us/Babies "R" Us. The company currently operates 900 stores in the United States and PR (5 stores) and 716 stores in 34 other countries, with some of them under franchises or licenses. The flagship store in New York City's Times Square is the largest toy store in the United States, featuring a colorful ferris wheel. 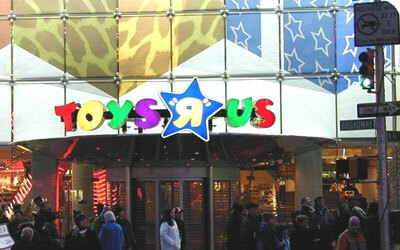 It is also the second largest toy store chain in the United States (Wal-Mart being the largest). Updated the file. Decrease of 19 locations. Updated the file. Net decrease of 156 locations. Complete update of the file. Updated the file using the latest data from the website. Net increase of 157 locations. Updated the file to the latest listing on the website locator. Updated the file using the data from the website. Listing now includes the Express locations. Reformatted the file. It now includes Babies "R" US and Kids "R" US. All locations were taken from the website locator.